This summer, Mariah Voutilainen went on a whirlwind weekend trip through the Olympic Peninsula with her husband and two children (ages 3 and 5). In just three days and two nights, the intrepid Seattle-based family visited Sequim, Dungeness Spit, Port Angeles, Joyce, Makah Indian Reservation, Cape Flattery, Elwah Dam and Hurricane Ridge. That’s a total of 339 miles — but who’s counting? Let’s find out more about Mariah’s trip through the Olympic Peninsula. Q: What was your favorite town or destination in the Olympic Peninsula? What did you like about it? My favorite part of the trip was the drive from Sequim all the way to Cape Flattery. I really liked the small town of Joyce, Washington, with its historic general store museum. The museum was open on Sunday morning, and the woman who worked there knew a lot of history, including facts about the train that used to come through the town, and the people who settled there. Kids were welcome to touch and try out the artifacts in the museum, including the old-fashioned fire truck and the horse carriage. The Makah Cultural and Research Center at the Makah Reservation was also very interesting, although not completely finished in some places. There were also kid-friendly exhibits there, and a very nice gift shop where you could buy a permit to be on the reservation as well as Makah/Native books and paraphernalia, including locally made jewelry. Cape Flattery was absolutely gorgeous! The hike through the woods was very easy–it was mostly paneled with wood planks so that you could easily stay on the trail. There were several look-out points that had amazing views of the water. It was really amazing to be at the western-most point of the United States. Q. What can you do with kids in the Olympic Peninsula? What did you enjoy most? I think the boys enjoyed almost everything, but they really liked the Dream Playground at Erikson Field. We went there and they had a ball. Additionally, they thoroughly enjoyed getting amazing ice cream at Buzz, a local coffee shop and ice cream parlour in Sequim. I’d have to say that the small scoop of ice cream was actually half a pint! Q. 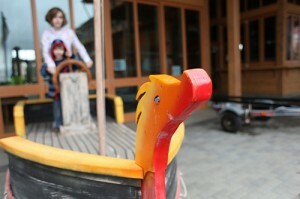 Did you come across any child-friendly restaurants while visiting the Olympic Peninsula? The two restaurants we ate at (a cafe on the Makah Reservation called Whalers Moon Delight, and a Mexican Restaurant called Fiesta Jalisco in Port Angeles) were both fine, although I wouldn’t say that they were particularly “kid-friendly.” The food was nothing to write home about, really, at either one. Q. That’s too bad. Did you like your hotel in the Olympic Peninsula? We stayed at the Holiday Inn Express in Sequim. It was a pleasant, affordable place to stay, with rooms that looked recently updated. Most importantly, they included continental breakfast, which at these types of hotels nowadays include either make your own waffles or pancakes (this one had pancakes, which were really fun for the boys to make). Also included was a pool and hot-tub, which were a good distraction for the boys, who went to swim twice. Q. Anything else you’d like to say? Why would you recommend a trip to the Olympic Peninsula to families? Definitely would recommend a trip to Sequim and all the other places we went. The lavender farms in Sequim are lovely, as is the Dungeness Spit beach. So much to do there, and it doesn’t take long to do if you plan it correctly! I’d never given much thought to the area around Port Angeles, Washington. I thought of it as a working town, without much for kids. Just a stop en-route to and from Victoria, BC. But our recent trip enlightened me. I now think the Olympic Peninsula’s outdoors options are among the Pacific Northwest’s best bets. Adventure comes in all sizes here, whether you let a inch-long crab pinch your finger or you’re willing to summit a 5,200-foot-tall, wildflower-draped mountain. 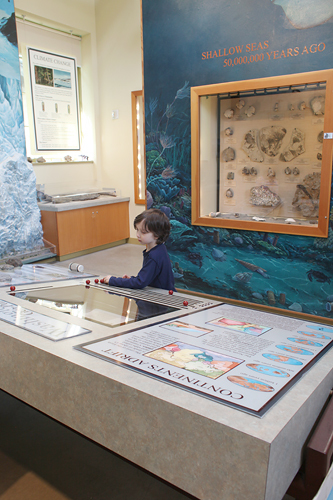 If you’re going on a family trip to the kid-friendly Port Townsend, make time to explore the Olympic Peninsula’s natural wonderland. Port Angeles makes for an easy day-trip from Victoria, BC, just a quick 1 1/2-hour long jaunt on the M.V. Coho. 9 a.m. Breakfast in Sequim. Start your morning off right with breakfast at the Oak Table, a kid-friendly Sequim institution serving up a variety of carbalicious breakfasts. 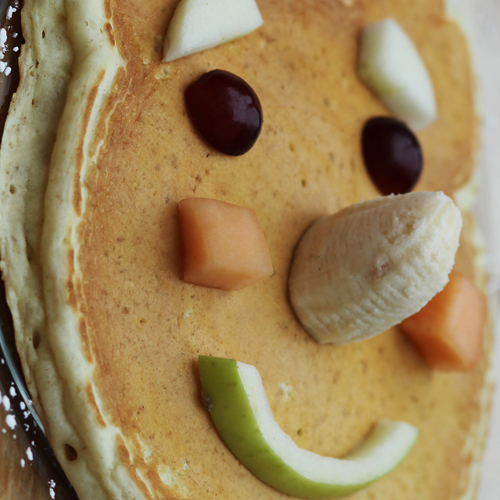 Inside the handsome oak dining room, families share enormous pancakes and egg dishes. The kitchen rings a bell whenever a soufflé-style apple order is up – the waitress has less than a minute to deliver the three-inch-high pancake to your table before it collapses. 10 a.m. Tongue Point Marine Life Sanctuary. located about 30 minutes west of Port Angeles, boasts one of the best tidepooling spots in Washington State (and one of the funniest names). 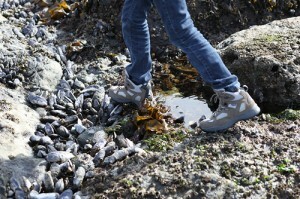 Put on your hiking boots, then take the staircase down steep bluffs and onto the mussel-covered, rocky shore. Six-foot-tall boulders and slippery seagrass encircle tidepools filled with purple urchins, blood stars and gregarious hermit crabs. Bring a field guide to identify sea life, because you’ll find plenty of it. Two caveats – check the tide schedule before going out and wear sturdy shoes that can get wet and can take a beating. Toddlers and skittish preschoolers will face a difficult time climbing up and down the bluffs and staircase; be ready to haul them down and back up. And once up, although the cliffs are fenced off, hold your kids’ hands and watch them closely. It’s a long way down them thar hills. 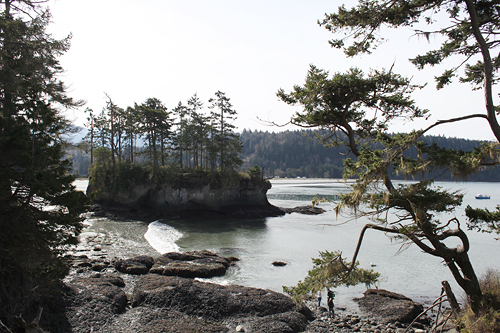 Tongue Point is located in the Salt Creek Recreation Area, an excellent family camping choice. Tree-sheltered sites, a playground, World-War-II bunkers, amazing views of the Strait of Juan de Fuca and ocean waves lulling you to sleep – sounds good to me. Noon. Lunch in kid-friendly Port Angeles. We ordered sandwiches from First Street Haven (107 E 1st St., 360-457-0352), which offers sandwiches, salads and soups. The dining room is small, homey and extremely popular with locals and visitors, and our sandwiches were big enough to share with the kids. Across the street, the chic Itty Bitty Buzz slings excellent take-away sandwiches — as long as you get there before they sell out. Locavores may want to browse the stalls at the year-round Port Angeles Farmers Market. 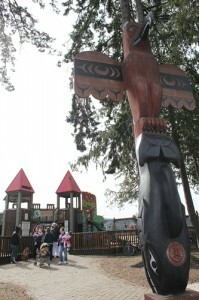 1 p.m. Eat lunch at the Dream Playground (at Erickson Playfield) , a community-wide project inspired by children’s dreams. After asking local kids what they’d like to see in a playground, the designers constructed a multi-use play area with a wooden castle, climbing equipment, a dragon-faced slide, swings, and a toddler-sized “town” with a ferry, bank and post office. 1:30 Olympic National Park with kids. Drive south toward the Olympic National Park, at the southern edge of Port Angeles. 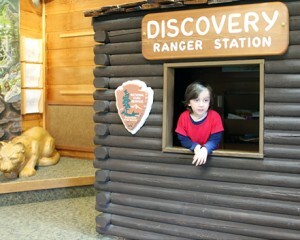 Stop at the Olympic National Park Visitor Center where the Discovery Room’s intelligent fun builds a few new brain cells. 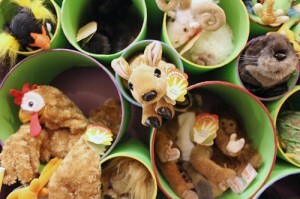 Kids can play at offering advice from inside a child-size ranger station, create a totem pole with felt, stick their hands inside a cougar’s mouth (OK, just the skull). 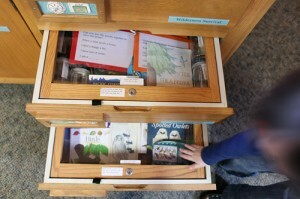 Drawers slide open to reveal thematic toys, puzzles and books. In the center’s main area, a life-size elk looks out over a 650-year-old tree cross-cut and a whale-hunting canoe. But remind kids to look up – there’s a cougar watching you from overhead. The gift shop offers all the usual park center goodies, but look for the junior ranger handouts, which the kids can fill out for a badge. The rangers are helpful but often overwhelmed by visitors; once you snag one, they’ll give advice on where to go in the massive park. 2:00 Hurricane Ridge with kids. Head up to Hurricane Ridge for the Olympic National Park’s most-scenic views — the $15 car fee is well worth the expense. The 45-minute drive takes you through various habitats and past lookouts (one incredible spot allows you to take in Bellingham, Victoria and Port Angeles all at once). For the best rubbernecking, bribe/plead/ask for someone else to drive. Sword ferns, leafy trees and huckleberry plants give way to moss-covered rocks, then to dark fir tunnels of thick forest. Basalt outcroppings and grassy meadows host deer, Olympic marmots and black bears. As you ascend to treeline and above, you’ll notice heart-stopping drops down steep valleys populated by wind-whipped trees. 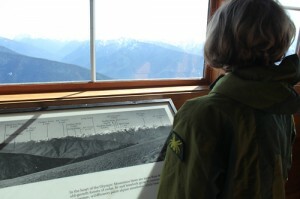 At the peak, you’ll find the Hurricane Ridge Visitor Center, an interpretive center with descriptions of the riotous floral rainbow growing outside and a 3-D diorama of the ONP. Look for the mountain map at the lookout, which makes sense of the jumble of peaks that surround you – with a little help, each one gains a distinct personality. The downstairs snack bar refuels before a ranger-guided interpretive hike. In winter, skiing, snowboarding and snowshoeing are popular pasttimes for those intrepid visitors prepared for the unpredictable winds that gave this ridge its name. 3:30 An art hike in Port Angeles. 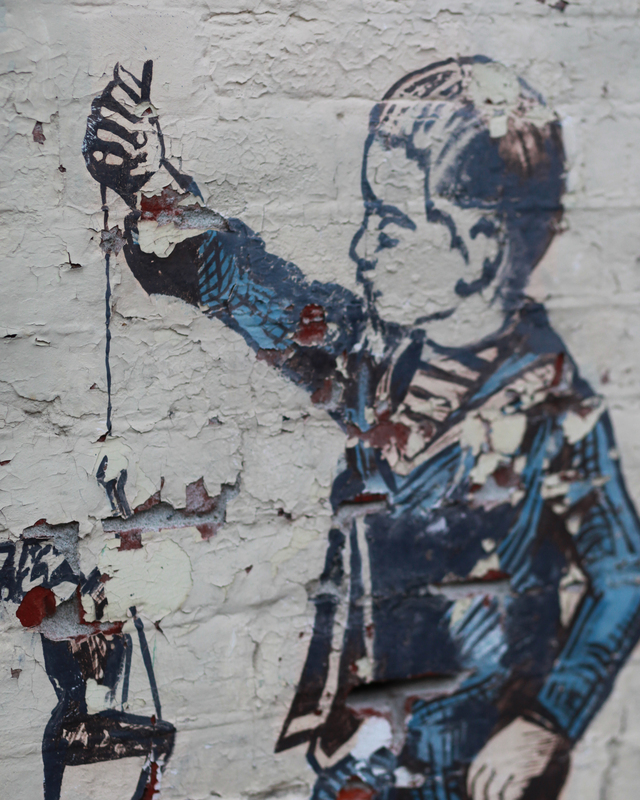 Have you ever been on an art ramble? I hadn’t. 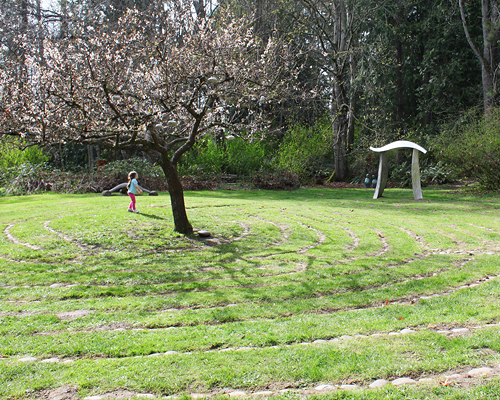 At Webster’s Woods Art Park, gentle, toddler-friendly trails take you through a forest of art. Look up, down and sideways to catch glances of over 110 artworks among evergreens. No, you won’t find a Van Gogh, but children generally love the playfulness, color and texture of modern art. Among many works, we found a giant spoon, a working gong, several painted bushes, a fire-hydrant-carved log and precariously balanced glass sculptures. And my favorite — a small grouping of tutu-costumed trees, ready to pirouette. More: Find excellent tips and suggestions from the Olympic Peninsula site, including a list of family-friendly activities. Find lodging and dining deals at the Port Angeles Chamber of Commerce. Spotlight: Fort Worden — Got a flashlight? Did you bring your flashlight? A headlamp, maybe? In Port Townsend, Wash., Fort Worden’s grey-concrete gun batteries once provided shelter to soldiers on the lookout for saboteurs, spies and submarines trying to enter the Puget Sound. Today, the batteries provide shriek-filled echo chambers full of childish delight. 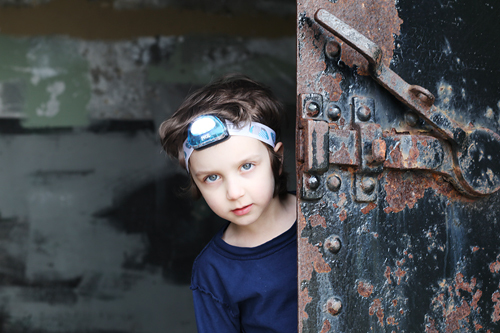 Play flashlight tag through windowless, unlit corridors and the barren, pitch-black rooms. Wear sturdy shoes and make sure your tetanus shots are up to date – broken glass and water are everywhere. The dank walls seem to reach out and touch you first, urging you to keep your coat on. Pick up a map at the visitors’ center, right inside the fort’s gates. If you have older children, you’ll want to make your way to the main cluster of bunkers, about a two-mile walk round-trip from a parking lot. It’s a 45-minute sojourn (without stopping), but you’ll be in the center of eight eeky batteries. With younger kids, go to Battery Kinzie, near the lighthouse. This set of spooky rooms only requires a one-minute walk from the car. Battery Kinzie, built in 1910, provides great views of the Strait of Juan de Fuca. Hold the kids’ hands and walk up the no-railing stairs; watch out for the thorny bushes that once prevented spies from sneaking in under the fog cover. Their prickly spines sprout from the ground, threatening pain. Does this all sound a little dangerous? It could be. But it’s not, not really. Just set some ground rules – don’t eat glass, don’t poke your brother in the eye with the thorn bush, and no, you cannot slide down the concrete slab. You’ll tear your pants and the enemy spies will see your underwear. If you can’t get enough of the freakishly cool fun, check out the gun batteries in Fort Casey, on Whidbey Island, Wash.
And don’t forget your flashlight. Find more family travel excitement over at DeliciousBaby’s Photo Friday. Port Townsend’s well-travelled residents wouldn’t accept just any ol’ menu. So you’ll find a wealth of kid-friendly picks to refuel your family travels and adventures. In the “Uptown” above downtown Port Townsend, you’ll find two excellent breakfast options within walking distance of the town’s Victorian-era mansions. Enjoy the fruits of residents’ refined tastes at Pane d’Amore, a tiny shop that brims with customers, before the sign is flipped to “open.” Kids love the cinnamon twists, a braid of crunchy, buttery delight. Adults might opt for the sophisticated apple-shaped danish. 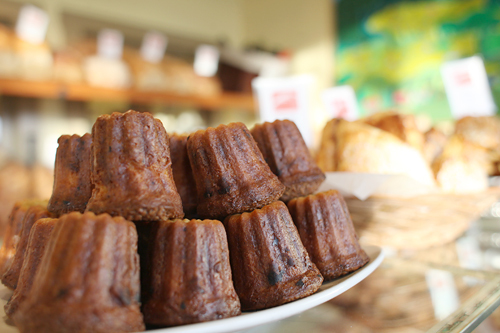 Eat these flaky delicacies outside or you’ll find crumbs under the carseats for weeks. If you’re looking for a little more ooh-la-la, take the family to Sweet Laurette’s Café and Bistro: chocolate croissants, pear galettes, metal chairs in a verdant outdoor dining area and full by 9 o’clock a.m.
And back in downtown, the brand-new Water Street Creperie’s (1046 Water St.; 360-385-1151) sweet and savory options satisfy everyone in the family. Order your cinnamon or chicken pesto crepe, then snag an outdoor table facing Water Street, the town’s main drag. So many choices. Such limited stomach real estate. 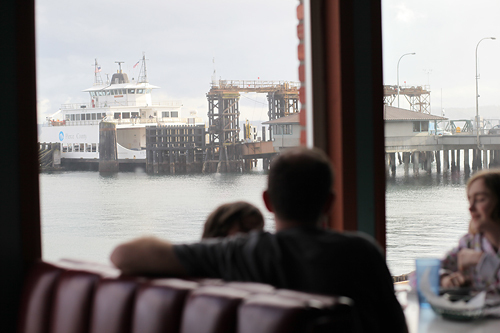 Follow your nose to Waterfront Pizza (951 Water St.; 360-385-6629), then choose from downstairs’ bustling take-away window or upstairs seats overlooking Port Townsend’s water street. Pizza takes time here – at least 20 minutes – so enjoy the Trivial Pursuit card-filled baskets, color with crayons and look jealously at your neighbor’s pie. The cornmeal-dusted crust is piled high with vegetables and meat; this is knife-and-fork pizza. Want something a little lighter? Salal Café (634 Water St.; 360-385-6532) presents sandwiches, soups and eggy entrees inside a window-wrapped, light-filled interior or out on the flower-full patio. Crayons and paper make their way to you upon your seating, and kids’ meals include a bear-faced pancake (banana nose!) and a heart-shaped grilled cheese. Try the homemade strawberry jam. If you love it, you can buy some to take home. For organic and locally-grown fare, Better Living Through Coffee serves hearty sandwiches, salmon chowder and small pastries from a premium location overlooking the water. Lunch on one of the low couches, while the kids read from the basket of picture books or look for the toy bags filled with simple games. Don’s Plaza Soda Fountain (1151 Water Street; 360-385-2622) serves a straightforward, no-nonsense meal. It’s an authentic 1961 diner spot housed in the rear of Don’s Pharmacy. Go to the back right of the store to sit on swiveling stools and order at a low counter. Burgers, dogs, malts, sundaes and phosphates are on the menu — same as 50 years ago — but with a modern-day addition of a Gardenburger. Here’s where things can all fall apart. You’ve hopefully had plenty of adventures by 5 p.m., and wisely choosing your evening restaurant makes for a memorable day (in a good way). Are the kids all kinds of whiny? Could you care less what you’re eating and want a view of the ferries leaving the Port Townsend dock? Eat at La Isla Family Mexican Restaurant (1145 Water St., 360-385-1714), a Mexican restaurant long on views and short on stylish décor. The menu is mediocre but it works; the cabbage salsa is different and delicious. Are the kids doing reasonably well? You want a beer, nice conversation, pub-style food and paper tablecloths the kids can draw on? Eat at The Public House Grill, a local favorite. The kids’ menu includes fish ‘n’ chips, salmon fritters and burgers. Are the kids behaving exceptionally? You want wine, foodie fare, sophisticated dining and $7/plate children’s meals? Eat at Silverwater Cafe, a restaurant that knows how to grill piece of fresh, wild salmon and serve it on a bed of wild rice and asparagus. Portions are small but perfectly cooked. After dinner, pick up an ounce of ice cream at Elevated Ice Cream & Soda Shop. This ice cream shop actually sells ice cream by the ounce, so even the baby receives a right-sized portion of vanilla-mint or one of the shop’s flavors of ice cream or Italian ices. Kids can sit at a petite French-style café table to devour their cone. Next door, a dentist’s nightmare of a candy shop sells delectable chocolates and giant lollipops. 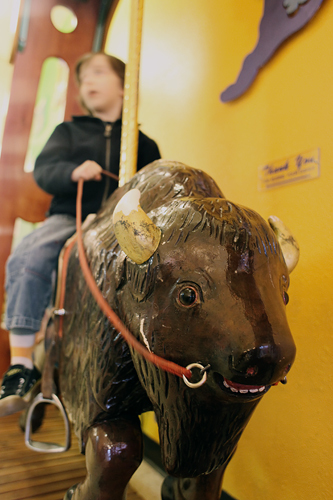 Bring change — for 75 cents, the shop’s vintage bison provides rides. A bison-ridin’, ice-cream eatin’ cowpoke in Elevated Ice Cream. Many Northwest adults remember Port Townsend, Wash., as a romantic getaway, full of proper architecture and fine dining. But you’ll be cheered to discover that Port Townsend loves traveling families, too. You won’t even need a stroller, because Port Townsend’s downtown core is an eminently walkable seven-block spread. How’s that for kid-friendly? One of only three Victorian Seaports in the United States and located 40 miles northwest of Seattle, Port Townsend’s a weekend escape. If you have a few extra days, it makes an excellent base for daytrips to Port Angeles and the Olympic Peninsula. Port Townsend is divided into two sections. “Uptown” is stocked with Victorian Houses and Euro-style bakeries; the neighborhood sits high on bluffs overlooking Admiralty Bay. The lower town, or downtown core, is where you’ll want to stay. This area extends from Upper Town like a butler’s platter, providing families with shops, restaurants and a museum or two. 1. Go to jail in the Jefferson County Historical Society Museum. 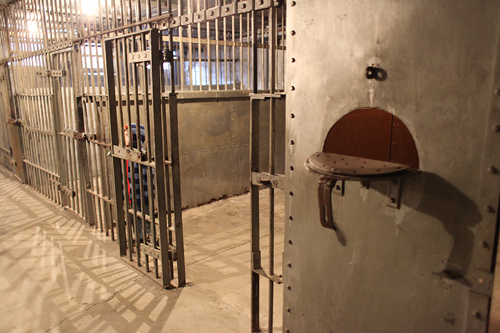 Let the kids put you in time-out (don’t forget to throw a fit) and give you their best lecture inside the old county slammer. Standing on the wrong side of the bars is an unnerving experience for any age; the rusty metal manacles increases the creep-out factor. A glass case displays olden-days teasets and dolls, although most kids will be more drawn toward the toddler-sized, non-functioning cannon. Count fingers afterward, just in case. 2. Browse the series at the indie, cozy Imprint Bookstore (820 Water Street). Along Port Townsend’s main drag, boutiques and shops beckon customers in. This indie bookstore is a winner. Sit at the low, circular children’s table and enjoy a picture book or the newest tome in the Diary of a Wimpy Kid saga. Point, laugh, repeat. No one will shush you. 3. Play pirate at the Northwest Maritime Center. A dragon-head ship waits in the breezeway and a wide concrete slab sets the stage for swashbuckling antics. Kids can look through windows at boat enthusiasts nailing and sanding wooden craft, or go inside for a closer view. Vintage kids decorate the city's brick exteriors. 4. 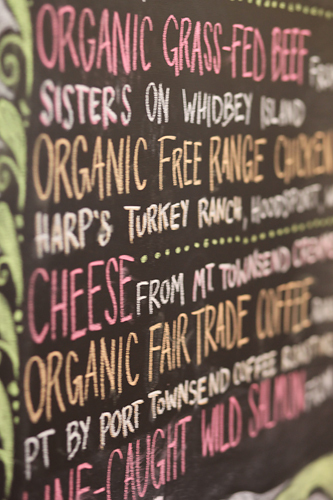 Enjoy music at Port Townsend’s Uptown Market. A farmers’ market featuring the best of local growers, families can nibble at cheeses and fruits and enjoy a song or two. Read my guide to enjoying farmers’ markets with kids and check out GypsyGuide’s beautiful write-up of her market experience. 5. Buy a fairy skirt at Seams to Last (940 Water Street). Well, your kid might be interested in fairy skirts – my son wasn’t. But I found a sweet selection of well-priced socks, consignment (yay!) and designer duds. The dressing room doubles as a kid-distracting toy room, and you’ll be cheered to know that the owner hand-sews all those fairy skirts. 6. Paint a picture at The Boiler Room. Tweens and teens enjoy this volunteer-run coffee shop, where local artist-kids hang out, make cutesy eyes at each other, jam with friends and play board games. Even younger kids can create quick paintings with the coffeeshop’s free art materials (but please make a donation and support this cool endeavor). 7. Ollie at the skatepark. The City of Port Townsend’s Skatepark (Monroe Street between Washington & Jefferson Streets) has a respectable number of bowls and ramps for a smaller town – teens can drop in and make instant local friends. 8. Sip a phosphate at Don’s Soda Fountain (1151 Water Street). An authentic 1950s diner spot housed in Don’s Pharmacy. The seats still swivel, just as they did decades ago. You’ll find burgers, dogs, malts, sundaes and other 50s foods, but with nod to the granola Northwest – Gardenburgers grace the menu too. 9. Port Townsend kids don’t suffer boredom gladly, judging from the number of well-stocked and expertly-curated toystores. Pick up the pieces at Completely Puzzled (1013 Water Street), increase your IQ with board and card games from Abracadabra (936 Water Street), and choose from science, stickers and stuffies at Sand Castle (840 Water Street). 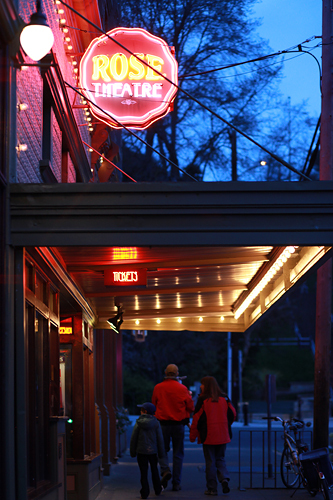 The Rose Theatre offers first-run movies and first-rate entertainment. 10. Watch a movie at the Rose Theatre. This gem runs movies inside velvet-drape lined screening rooms. The concession stand features locally made gingersnap cookies and brownies. The real-butter popcorn is served with a variety of shake toppings. (In my experience, it’s wise to forbid the kid-concocted combo of BBQ, brewer’s yeast and parmesan). An endearing touch: a human being announces the movie and provides a quip or two about the film’s creation. 11. Pick up insider info at the Fort Worden State Park Visitors Center. Fort Worden, a retired military base, now welcomes visitors to its 434 acres of museums, tidepools and barracks. Stop at the center to pick up a map, get directions to the lighthouse and visit the old military brig. Skip the artillery museum and the tour of the commanding officer’s quarters, unless your kids are huge military-history buffs. 12. Tickle a spiny sea urchin at the Port Townsend Marine Science Center. The Marine Exhibit’s limited hours don’t offer much to off-season visitors, so try to arrange your stay accordingly. The exhibit is a blast though — touch anemones, sea stars and sea cucumbers in tanks built for easy access and short arms. All of tanks’ creatures were sourced directly beneath the exhibit’s long-legged pier. Look beneath and around those docks when you’re here, as seal pups and river otters swim and splash in the area. 14. 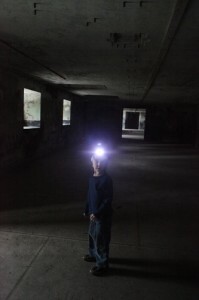 Play flashlight tag in Fort Worden’s abandoned concrete batteries. 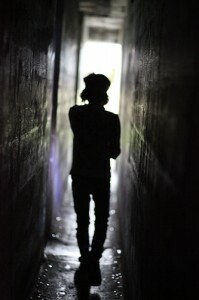 Walk through three-foot-wide pitch-black corridor mazes, feel the dank, dark dread building up – and tag! You’re it! Wear sturdy shoes and keep your tetanus shot up to date – broken glass and seeping water litter the irregular floors. With older children, make your way to the main cluster of bunkers(about a two-mile walk round-trip from a parking lot). For younger kids, the smaller bunkers (Battery Kinzie) near the lighthouse only require a one-minute walk from the lot. The lighthouse bunkers provide great views of the Strait of Juan de Fuca. Hold the kids’ hands and walk up the no-railing stairs; watch out for the thorny bushes that once prevented spies from sneaking in under the fog cover. 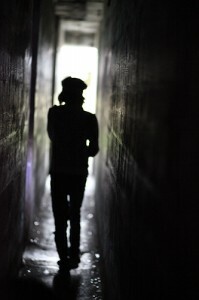 A flashlight illuminates a narrow hallway at the Fort Worden batteries. 15. Chase seagulls at Chetzmoka Park. Younger kids not quite ready for bed (and if there’s still light in the sky)? Chetzemoka Park (Jackson Street and Blaine Street), 5 minutes by car from downtown. Over five acres of sandy beach, tidepools, playgrounds, a secret waterfall and steep-sloped grassy hills – perfect for rolling down. By the time you’re done here, the kids will be asleep before you get back to the hotel. Getting There: Find turn-by-turn directions on the Port Townsend website. However, the site neglects to mention the easy access to and from Victoria, BC — you’ll want to take the M.V. Coho, then use the site’s directions from the West Olympic Peninsula. In spring and summer, families can also ride the Puget Sound Express between Friday Harbor and Port Townsend.